Potentionmeters are manually adjustable variable resistors with three terminals. Two terminals are connected to the ends of the resistive element, while the third terminal is connected to a sliding contact called Wiper.So by rotating the wiper, the resistance of the Potentiometer can be adjusted to its maximum value. The position of the wiper determines the output voltage of the Potentiometer.Potentiometer is commonly called as “Pot meter” or simply “Pot”. “Log ( Logarithmic ) Pots” are used as volume control and “Lin ( Linear ) Pots” are used for other applications.Different materials are used as resistive material in Pots. This may be Carbon, Cermet, Wire wound, Conductive plastic or metal film. Usually, the value of the Pot is printed on its body. 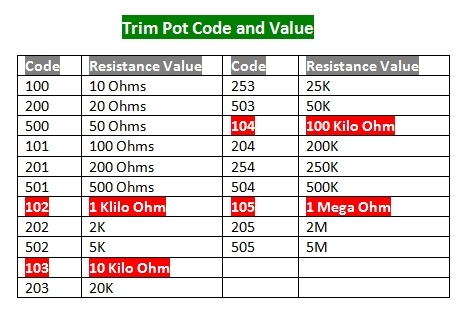 But the miniature “Trimpots” have codes to represent its value. For example, 102 (1K), 103 (10K), 104 (100K), 105 (1M) etc. Checkout the different types of Potentiometers.